We all agree: polar bears are often ferocious, sometimes adorable, and always majestic. But to Kal Barteski, they are also a work of art, acting as her muse and living, walking inspiration. 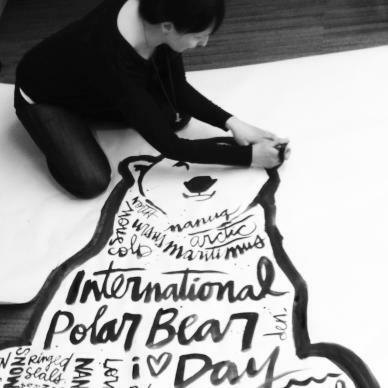 Known for her script, typography and breathtaking polar bear paintings, Kal Barteski might just be their number 1 fan. One thing is obvious: Polar bears are your spirit animal. How and when did you come to this discovery? I’ve always been an animal lover. I started drawing and painting wildlife when I was eight years old but polar bears really never made it onto my radar until 1996 when I moved to Winnipeg and met the lone polar bear at Assiniboine Park Zoo. Her name was Debbie. I was there with my art class to draw animals. I found myself by the polar bear because she sat very, very still and that definitely makes drawing easier. I had never seen a live polar bear before. She was magnificent. I felt drawn to her. I felt like I watched her so often I got to know her. I visited her regularly for many years, but her effect would take me more than a decade to realize. And now, twenty years after first laying eyes on her ­ I have completed over 150 polar bear paintings, given a polar bear TEDx talk, been a part of a polar bear documentary called Wild Obsession, participated in numerous polar bear projects, made a lot of polar bear friends and most definitely consider polar bears to be my spirit animal. 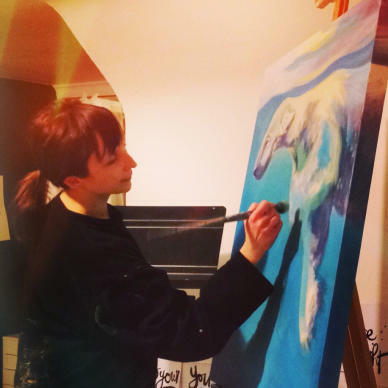 What about polar bears makes them a great muse for your art? Polar bears are incredibly inspiring to me. They actually make my heart beat faster. First, they are the largest land predators IN THE WORLD. That’s impressive. Secondly, they survive – no, dominate – the harshest climate on earth. That’s unbelievably cool. And thirdly, they are beautiful sentient beings ­ creatures of powerful opposing forces; white and black, dangerous but in peril, cute but terrifying, political and oblivious. I’m not sure you will find an animal with a more complicated history with man. I am fascinated by their beauty, their mechanics, their personalities, their histories… I feel so honoured when they show up for me in paint. You have called Churchill your happy place. How many times have you traveled to Churchill, and what makes you keep going back? I first visited Churchill in 2011 as part of an Animal Planet documentary/reality series called Wild Obsession. I fell in love instantly. There is an energy you can feel and ­ it’s almost impossible to describe. The people are amazing. The scenery is gorgeous. There is a magnetic pull to be close to the bears. It’s exciting. It’s extreme. 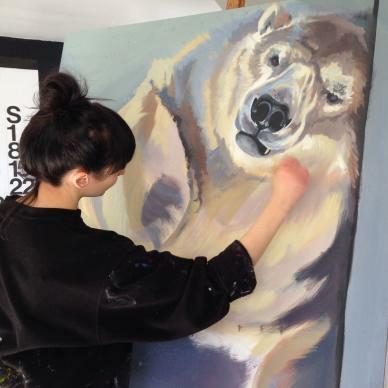 I’ve gone back every bear season since then and I hope to return every year until I die ­wishing to one day acquire studio space to allow me to work/paint on location for the entire bear season. What has been your number one breathtaking, heart stopping, ‘wow’ moment in Churchill? 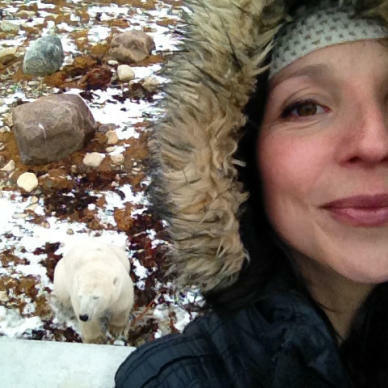 Without a doubt,­ the biggest ‘wow’ moment for me was standing on the shore of the Hudson Bay watching gorgeous, surf­able waves roll on my left, with a polar bear sleeping on the rocks at my right. It was unbelievable. That was my very first Churchill moment and it blew my mind. The ‘bite shape’ at the top of the province of Manitoba is actually the coast of AN OCEAN! There are whales and bears and an unbelievable collection of wildlife and plants ­unlike anywhere else in the world. I was suddenly very, very proud to live in Manitoba, to be Canadian and to have had the privilege of standing in such a precious place. We are so lucky to be here and ­ I don’t think people realize it. That huge ‘wow’ moment has many, many runner­up moments like looking a polar bear in the eye, seeing the Northern Lights dance, watching a mom and cub moment, being out on the Tundra and especially being in such close proximity to polar bears. There is an energy you can feel in Churchill. Do you have any advice for someone who might be interested in seeing polar bears in Churchill? GO RIGHT NOW! Take a train, take a plane, start the journey. Make seeing your own province high on your priority list. It is such a gift. Book a tour, see the bears, meet great people. Ride a Tundra Buggy™! Go dog sledding! Have cocktails at the local pubs. (People are always surprised + impressed by the delicious food found in Churchill!) Experience the land that is both sacred and precious. Most of all, RESPECT THE BEARS. Understand that it is a great privilege for us to share space with the magnificent beasts. They were here first. And lastly, where can people find your art to purchase? Join us on Facebook, Twitter and Instagram for #PolarBearWeek giveaways featuring Kal’s artwork all week long!